Highly tolerant of root bound conditions, this rapidly growing plant is an elegant addition to any homes décor. The Spider Plant features a beautiful array of long, narrow leaves that come in several different variations such as dark green with yellow stripes or variegated speckles being among the most common. The task of watering the Spider Plant could not be easier However, as with all plants, it is important to watch for over watering as this can cause root rot. Keeping the soil consistently moist is a great way to promote healthy growth. It is also important to note, that this plant is highly tolerant of dry soil during the dormant months of fall and winter. During the process of watering your Spider Plant, you start to notice the tips of leaves turning a shade of brown; you may want to consider an alternate source for water. Water from the tap is for the most part okay, however there are a few problems with water that is in big cities. In order to keep city water clean, chemicals such as chlorine and fluorine may be added. These chemicals can be very toxic to your Spider Plant. If you live in the city, alternatives such as collected rainwater or purified water without added minerals work best. Being the ever popular easy care plant, the Spider Plant can tolerate minimal amounts of light as well as hours of intense direct light. However, the most ideal situation for this plant is a few hours of reflected light in an area of the home that has a temperature of about sixty-five degrees Fahrenheit. If the temperature falls to around fifty-five degrees Fahrenheit at night, the Spider Plant will do very well as these are conditions of their natural origin. Feeding a Spider Plant is another area where things could not be simpler. As with all plants though, it is important to remember not to over or under do it. A liquid fertilizer of NPK can be administered every three to four months during the active growth seasons. No fertilizer is required during the months of fall and winter. That leaves this plant needing food only two or three times a year. The Spider Plant is not only known for its beautiful foliage, but its elegant star shaped flowers as well. These flowers will appear during the summer months and are displayed at the end of stalks which can grow to be three feet long. If you happen to notice a lean or slight bending due to the weight of the stalks, simply stake the stalks. 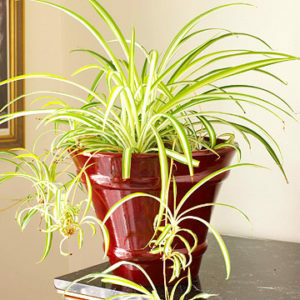 The Spider Plant can also bloom in the spring and fall months as well making this plant unique and highly desirable. This species of plant makes for an excellent hanging basket. However, its rapid growth may require a re-potting or dividing within a two year period. A healthy Spider Plant can grow to be a few feet wide as well as two feet high in addition to the flower stalks. The healthy growth and girth of this unique plant has been known to crack a few sturdy clay pots. Making the decision to add a Spider Plant to your indoor garden will give your home a beautiful and elegant look that will delight you for years to come. Contact us today at Orlando Outdoors!